It's hard to believe that a person like Greg Mortensen exists today. What he has achieved by setting up hundreds of schools in war-torn and poor regions of Pakistan and Afghanistan is no mean feat. And that too, with just the determination and will to power him though. 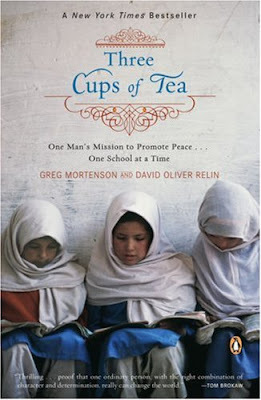 The book, Three Cups of Tea, is authored by Mortensen and David Oliver Relin and narrates how Mortensen went from being a mountaineer to a promoter of peace and goodwill. Mortensen's story is an extraordinary one, not because of the extraordinary dreams he had but because he's actually achieved them. Staying with the people in the most isolated mountains of Pakistan, Mortensen realises how important a good education is to them. He promises the people of Korphe to build a school for them and after years of struggling and encountering all sorts of hardship, he succeeds in keeping his promise. He does this while not having a full-time job and sleeping in his car. As you progress through the book, you realise that it is only Mortensen's compassion and his determination to do good that keeps him going. Otherwise, for a man who has no funds and is an American, it is almost impossible to win the cooperation and hearts of people in the innermost regions of Pakistan where even the government has not been able to do much. After years of struggling and striving, Mortensen succeeds in setting up the Central Asia Institute (CAI) which exists today and has become a full-fledged organisation promoting peace through education. Mortensen's logic is that terrorism is bred when uneducated children are brainwashed by conniving fascists. A modern education is the only way to avoid this and CAI concentrates on education above all the other things it does to help the downtrodden and needy. No book review can do justice to this book which must be read in its entirety to comprehend the full power of Mortensen's work. Read Three Cups of Tea for sure, but also do what you can to support CAI and its noble initiatives. I agree with the author even though I have not read the book. If you take care of education of people, they will take care of rest of the things. Educating people is highly important to make them feel that they can contribute and prosper with other parts of the world.